Black union construction workers earn 36.1 percent more than black nonunion construction workers. Because black workers have better wages and greater employment in the union relative to the nonunion construction sector, the presence of unions and collective bargaining in New York City greatly boosts overall annual earnings to the black community from construction by 83 percent, or $152 million each year (compared to the construction sector having nonunion pattern of employment and wages). We start our analysis with the CPS data on construction occupations in the construction industry sector among those living in New York City (See Appendix for data details). Table 1 provides a demographic breakdown of the union and nonunion sectors. 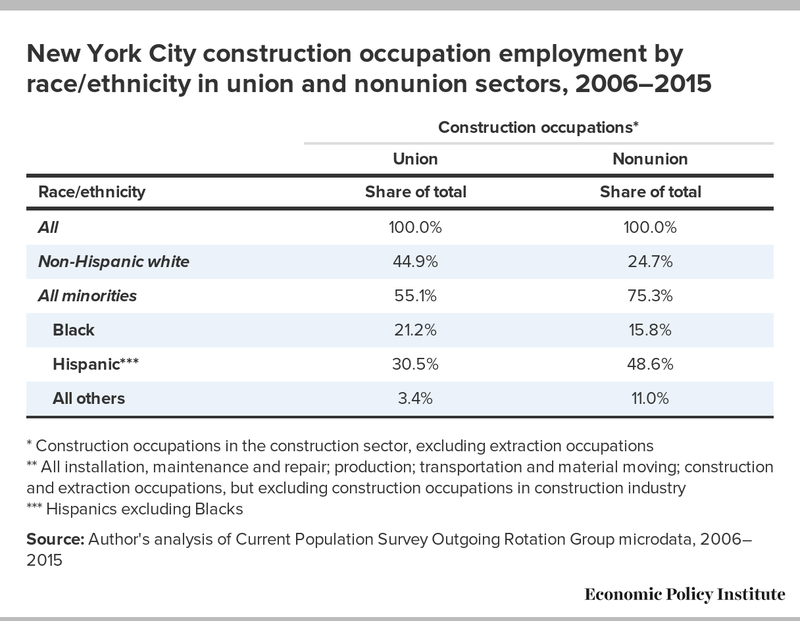 Non-Hispanic white workers are a minority in both the union and nonunion workforces in the NYC blue-collar construction occupations. Black workers comprised 21.2 percent of the blue-collar construction workforce in the union sector. In contrast, black workers are severely underrepresented in the nonunion blue-collar construction workforce, comprising just 15.8 percent of the employment. 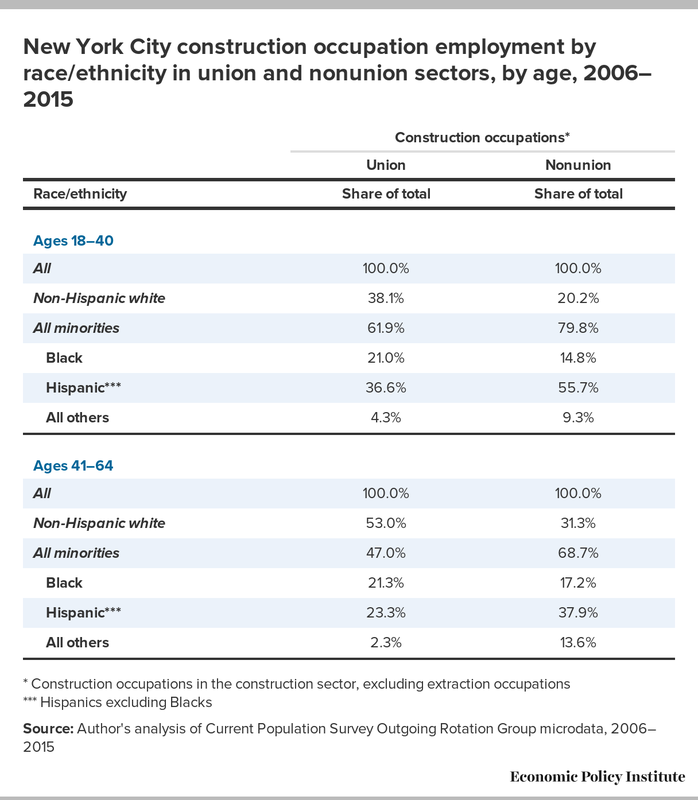 So, black workers are far more underrepresented in the nonunion than in the union construction sector. Hispanic workers are heavily over represented in the nonunion sector where Hispanic workers comprised nearly half of all employment, 48.6 percent. As the Fuchs et al. Columbia University (2014) study documented, there has been impressive improvements in the diversity of those being brought into the union construction sector via the apprenticeship programs. These data are updated below. To gauge how much impact this has had on construction employment in the union sector we examined the same group as above but separated out those ages 18–40 from those ages 41–64 (Table 2). This will not capture all the progress since these data average over the years 2006 to 2015—had we enough data to examine the last few years the apprenticeship data suggest the diversity of the younger workers would be even greater. Black workers are represented in the younger union workforce comparable to that of the older union workforce, at 21.0 percent for younger workers and 21.3 percent among older union workers. Black workers are more underrepresented in the young nonunion construction workforce (just 14.8 percent) than in the older nonunion workforce (17.2 percent). This suggests that black under-representation has been growing in the nonunion construction sector whereas it has been stable in the union sector. The share of jobs held by Hispanic workers has grown in both the union and nonunion sectors but far more strongly in the nonunion than the union sector. Hispanic workers are much more represented in the younger (36.6 percent) than the older (23.3 percent) union workforce. Hispanic workers now comprise more than half the younger nonunion workforce (55.7 percent), up from the 37.9 percent in the older nonunion construction workforce. The share of non-Hispanic whites in the union sector was 38.1 percent for the younger workers, ages 18–40, a substantial decline from the 53.0 percent share of non-Hispanic whites among the older workers (ages 41–64) in the union sector. One important metric for assessing the seriousness of efforts of building trade unions to increasing diversity is to examine the race and ethnic composition of apprenticeships, essentially the flow into membership and construction employment in the union construction sector. The Fuchs et al.’s review of apprenticeship data shows remarkable progress in inclusion. The data from this report, updated to include comparable 2014 data, are presented in Figure A. The white worker share of apprenticeships of New York City residents in 1994 was 63.7 percent which by 2012 and 2014 had fallen to, respectively, 33.6 and 38.2 percent. (Correspondingly, the share of apprenticeships going to minorities rose from 36.3 percent in 1994 to 61.8 percent in 2014 and was an even higher 66.4 percent in 2012.) Particularly impressive is that the share going to black residents has roughly doubled from 18.3 percent in 1994 to 35.1 percent in 2014. Similarly, Hispanic apprenticeships have risen from the 16.0 percent share in 1994 to the shares in 2012 and 2014, respectively, of 27.6 and 22.2 percent. As these programs remain in place, the entire union construction workforce will become increasingly diverse. Note: "All minorities" includes black, Hispanic, and other races, not including white. As discussed above, blue-collar black workers are more represented in the union than the nonunion construction sector of New York City, and increasingly so. The forthcoming report uses the same Current Population Survey data to document that union black construction workers earned 36.1 percent more than nonunion black blue-collar construction workers in New York City. Together, the greater employment opportunities and wages for black workers in union construction mean that the African-American community would have far less earnings from the construction sector if it were to be wholly nonunion. In fact, the report concludes that nonunion conditions would reduce black construction sector earnings from $335 million to just $183 million each year, an annual loss of $152 million for the black community. Put a different ways, the hiring patterns and wage levels in union construction boost earnings to the black community by 83 percent, from $183 to $335 million. This analysis is based on the monthly Current Population Survey (CPS) household survey regularly collected by the Bureau of Labor Statistics (BLS) to track unemployment and other labor force characteristics and outcomes, including wages. The Current Population Survey collects information from roughly 60,000 households each month which produces observations on approximately 170,000 wage earners each year. In order to identify the characteristics of New York City construction employment, union and nonunion, the analysis aggregates ten years of CPS data, the 2006–15 period. The CPS provides information on the age, gender, education, occupation, industry, and geographic location of each wage earner and their employment status (employed, unemployed, not in labor force) and wages. The CPS also provides information on whether a wage earner is a union member or covered by a collective bargaining agreement. If either status is true, we consider the worker in the union sector. The CPS is the only data source that enables an analysis of the demographic diversity in the union sector and to be able to compare it to the nonunion sector of a particular industry or group of occupations: this analysis examines blue-collar workers ages 18 to 64 in construction occupations (excluding supervisors and those in ‘extraction’) in the construction industry in New York City. The race/ethnic categories are non-Hispanic white, non-black Hispanics, blacks (Hispanic or non-Hispanic), and ‘other non-Hispanics’. * This report was commissioned by the New York City Building Trades Council (BTC). Lawrence Mishel is the president of the Economic Policy Institute. Teresa Kroger provided research assistance for the report and this blog post.